Coach Willis and Chanel inspired handbag. Lynne: I suppose that Crafty Challenge 4 really was my idea. 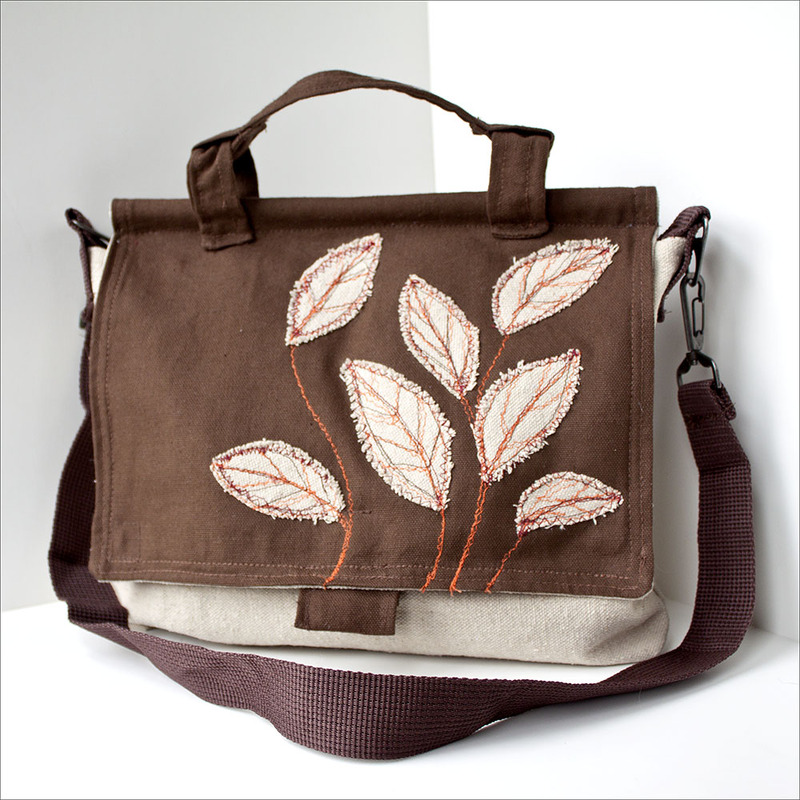 I have been carrying the handbag I made for Crafty Challenge 2 and it was not really designed for everyday use. So I needed a bag to carry through the winter. The crafty challenge seemed like a good way to make myself make one. I believe Cheri deserves the blame for the Coach Willis idea. The Willis bag is a deceiving design. 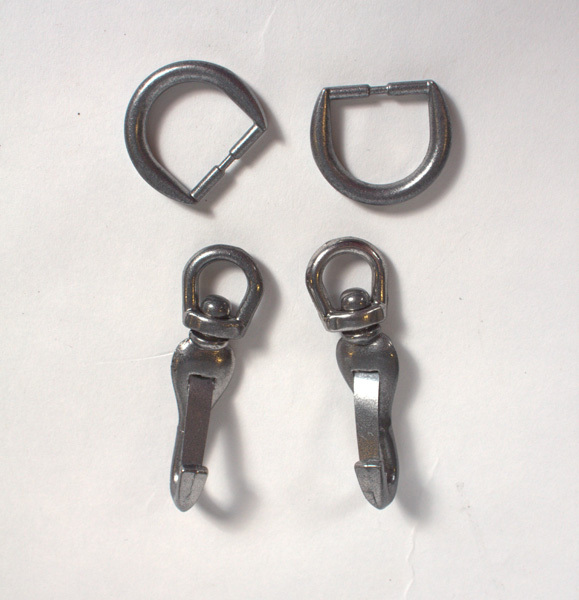 The rod and handle assembly is complicated and that type of handle puts a particular stress on the closing clasp. 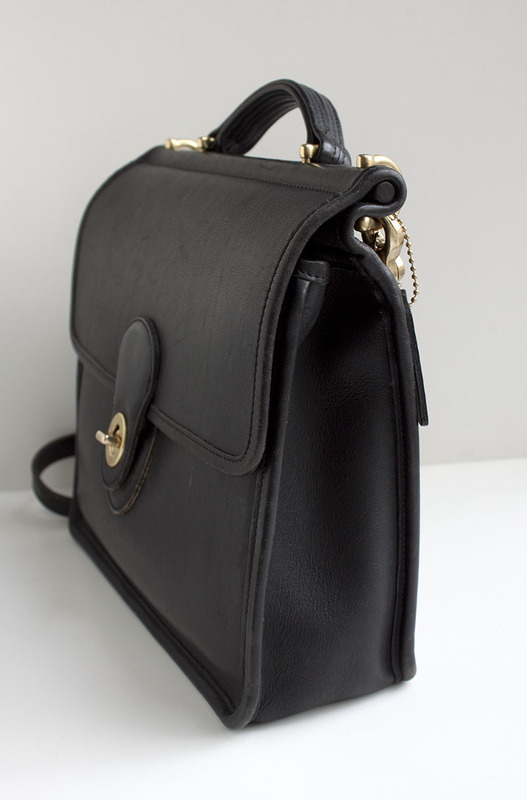 This means that the bag needs to be made of strong reinforced material and that the position of the clasp has to be precise for the handbag to hang right. But what you don’t know beforehand can keep you from ending before you start. 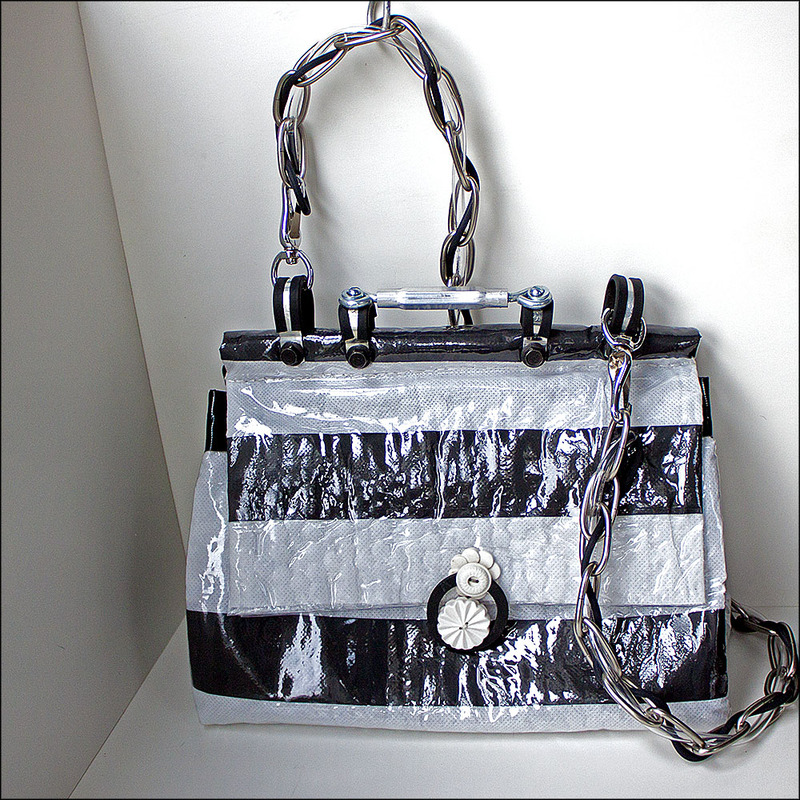 Since I was still fascinated by the possibilities of fused fabrics, I wanted to make the handbag from plastics. At a garage sale the other day, I found two white carrier bags for 10 cents. 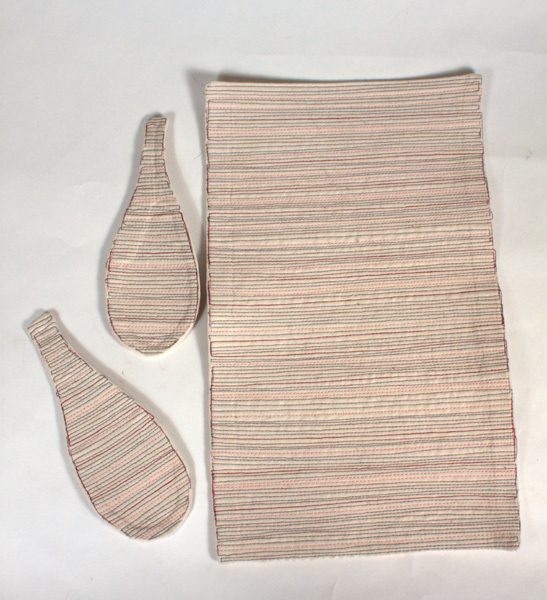 These were department store bags that were made of the same material you find in the rectangular totes that are sold in supermarkets to reduce the number of plastic bags they give you. This material is some type of polyester and it does fuse with an iron. Not easily, but when used with other more amenable plastics it works. 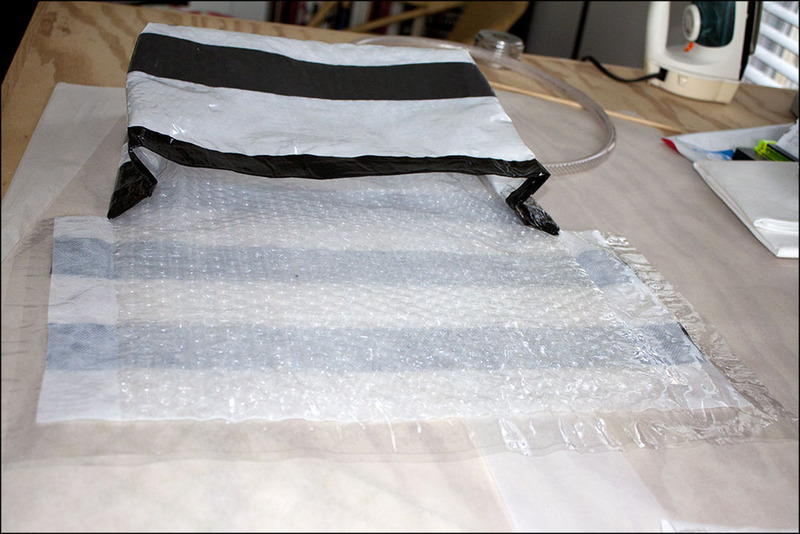 I made a fused fabric sandwich of bubble wrap, carrier bag and plastic vinyl sheeting. Each layer of the fabric has its own purpose. The bubble wrap provides sturdiness and a unique texture that I am particularly fond of. 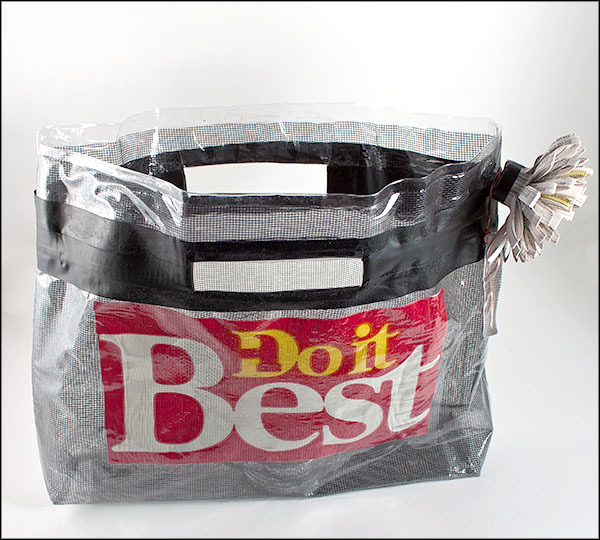 The carrier bag provides color and the plastic vinyl fuses everything together while making a durable surface for the exterior of my handbag. 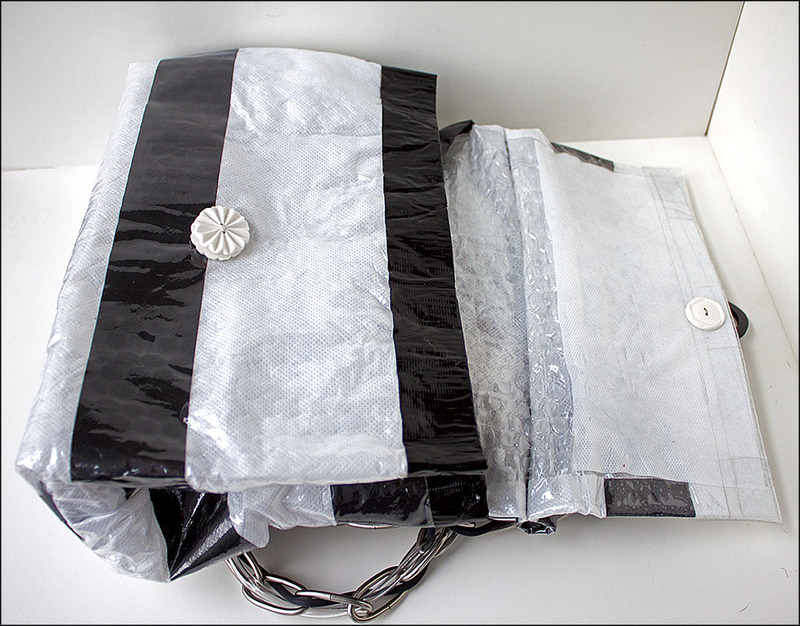 I used black duct tape to add stripes to the white of the carrier bag and to reinforce the top of the base of the bag. 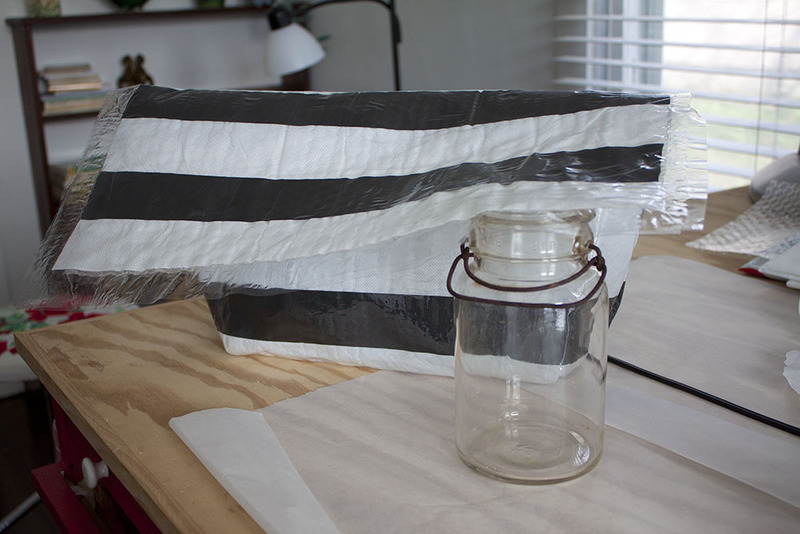 I fused the layers into a rectangle of the size I wanted following the general directions of the duct tape bag described here. I added extra inches for the flap because I did not want to put a flap on after the main body of the bag was done. I wanted the strength of one continuous layer of fabric. The hardware for the handle and rod assembly was the hardest and the most interesting part. I have always liked the leather-laced chains of the Chanel 2.55 bags and I had several feet of wonderful chain left from when Loryn and I put up new chandeliers in my living room and studio. The shape of the chain made it difficult to use standard rings to attach it to the handle. This meant I needed to go to the hardware store. I love our local Arone Hardware store because there are lots of parts and pieces that are not packaged and can be bought one at a time. I needed the plastic sheeting for the fused fabric, stiff plastic hose for the handle rod and smaller, clear tubing to lace through the chain. I thought the chain needed a little more cushioning and I found that the spline used to make screens made a great black accent in the chain. Rubber-coated hose clamps, fasteners, nuts and bolts and a turnbuckle for the handle made up the rest of the hardware I needed. I don’t want you to think that I had much of a plan when I went to Arone’s. I spent a lot of time wandering from one aisle to the next just picking up things and checking to see if they would fit together. The staff there are great and let me look without interruption, although I see the guys shaking their heads every now and then. That is one of the fun things about these challenges, we are going into areas we have never been before and anything can happen. A terrible mistake can turn out to be the most brilliant idea ever and vice versa of course. The clasp closure was the next most difficult thing. I did not want the weight of a hasp type of hardware attached to the front fabric of the bag. I wanted to use some of our vintage buttons and I thought that buttons sewn together with a button on the interior would help carry the weight of the bag through the whole structure of the fabric. The bottom of the clasp is 4 buttons sewn together. Two buttons with a small button in between to make a channel for the gasket loop were sewn to the outside of the bag and another button was sewn to the inside of the bag. The top of the clasp is 3 buttons sewn together with a rubber gasket. Small button, gasket, large button were sewn to the outside and another large button was sewn to the inside. I put holes in the gasket with an awl and just sewed through it the same time I sewed the buttons. The clasp was also a process of trial and error and I had buttons strewn everywhere on my table. I was getting desperate for a loop when Cheri showed me a zip-lock bag full of washers she had just picked up at a garage sale. I casually snagged the largest one and went home to finish my bag. The handbag is much roomier than I thought it would be and I really enjoy carrying it. It has a solid feel without being too heavy and I know there is not another one out there like it. Click the thumbnails below for a gallery view of the photos. Finished Coach Willis and Chanel inspired bag. 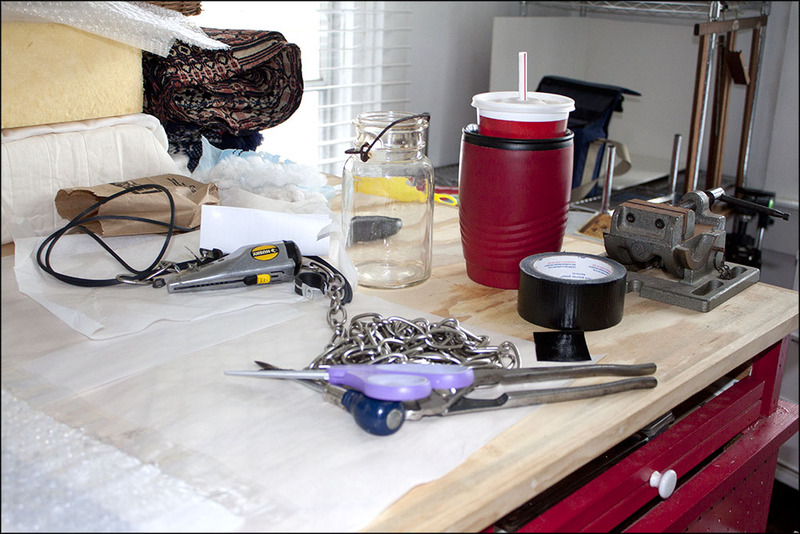 Chain, screen spline, duct tape and the ever necessary Diet Coke clutter my work table. Surprisingly, I find I use a mechanic’s vise quite often. It was good for drilling the holes through the rod assembly. 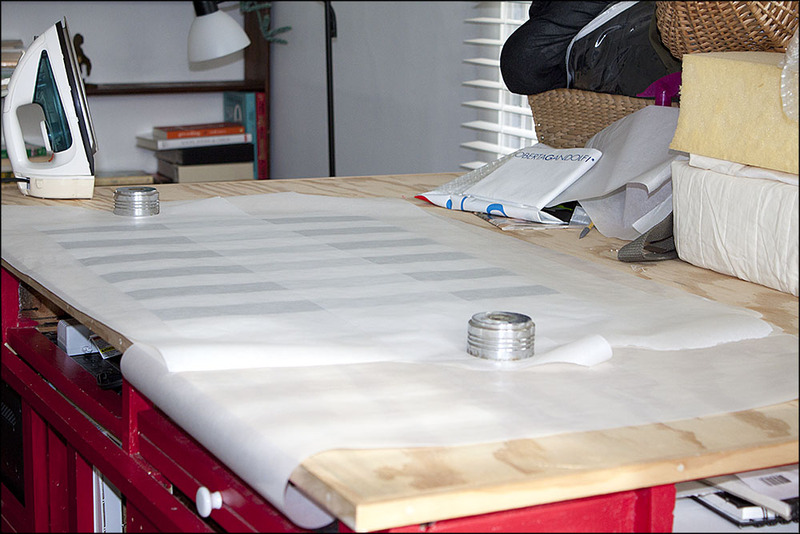 The fabric is laid out between sheets of parchment paper on my table and ready for fusing. 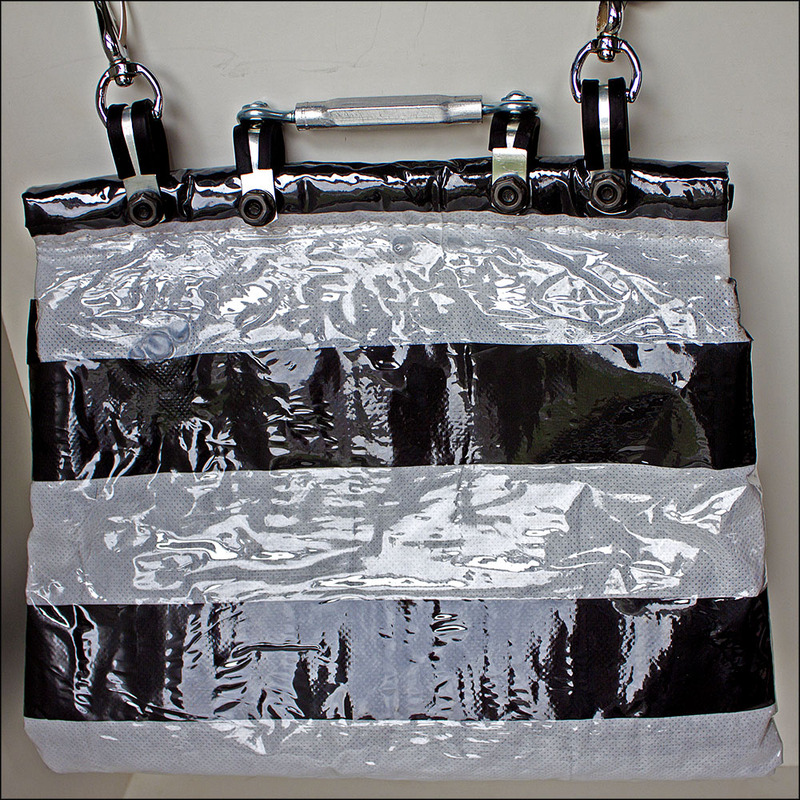 The black stripes of duct tape were put on the carrier bag fabric before I fused the fabric. The base of the bag is fused together and I am reinforcing the flap. I used the mason jar as a sewing ham to iron the side seams flat. The turnbuckle makes an interesting handle. It is screwed to the hose clamps. 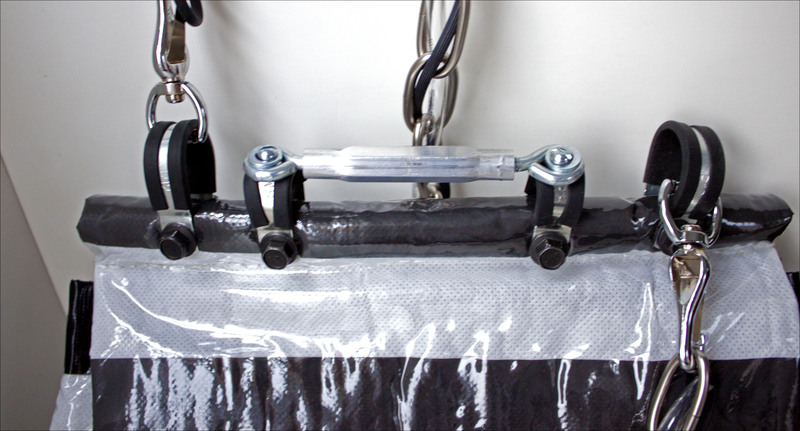 All 4 hose clamps are secured with nuts and bolts through the rubber hose rod. The clasp with its buttons and gasket loop. Back of the finished bag. Coach and Willis inspired handbag. My interpretation of the spirit of the Coach Willis bag. Cheri: Whew, what a challenge this was. It was tough one, but, it was also an awesome one. I think I spent the first week trying to decide how and what I wanted to make my purse out of. 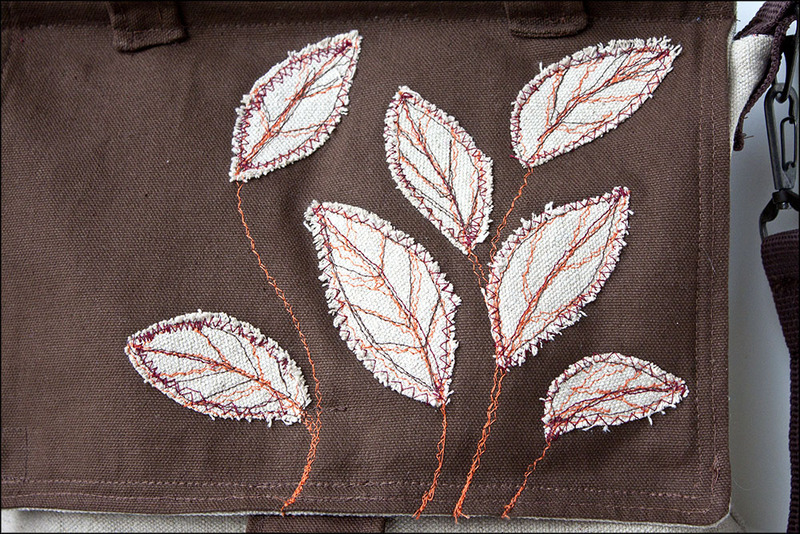 I have always enjoyed doing machine embroidery, so I decided that I would embroider the outside of my purse. I was pretty sure in my head of how I wanted it to look, so I looked around at my fabric supplies, (which is not nearly as grand as Loryn’s), and chose what fabric I wanted to use. After one failed attempt with the fabric I had on hand, I decided to buy some new fabric. I headed to our local Wal-Mart, which has just put in a small fabric selection, after our Jo-Ann’s closed, and chose a half yard of brown canvas, I also picked up some lining fabric that went with the brown nicely. With fabric in tow, I headed home. This was Thursday, I had 3 more days to go. I have to admit that my style of crafting is a tad bit unique. I don’t really measure anything. I will try to use a straight edge to get the proportions right but more often than not I will use the selvage edge to base my edges on. And so the great purse challenge began for me. I worked until midnight on Thursday, midnight on Friday and started working again at 2:00 pm on Saturday. Most of the time was spent with the embroidery and the base of the bag, and then the unspeakable happened, I accidentally melted some of the lining of my bag with the iron. I knew that this was not going to be an easy fix. So after entertaining several options I picked up some other fabric I had on hand from Loryn’s stash and started working with this. Essentially, I started again from square one. I spent several hours on Saturday redoing my purse and in the end I was really happy with how it turned out. It looks like me and I am really quite proud to carry it. 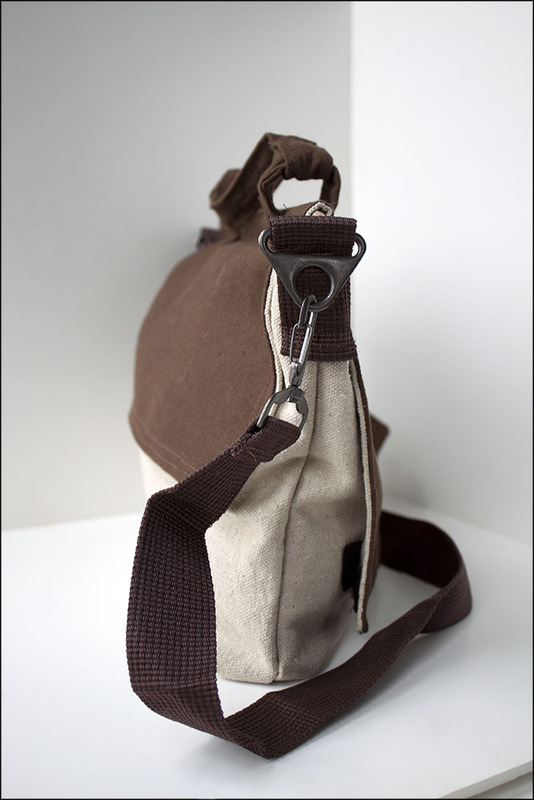 The back of the bag and the details of the handle. The side of my bag and a close up of the hardware I used. 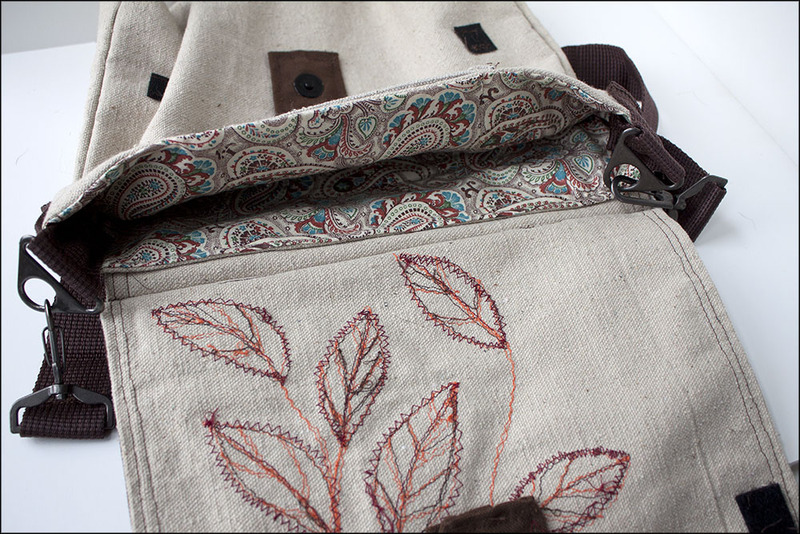 The lining of the bag and the reverse side of the front leaf embroidery. The reverse looks as good as the front. This pocket holds my phone. Lynne: I really enjoyed our crafty challenge 3. I thought all of the projects were fabulous and I’m still experimenting with the different papers in my new notebook. But now, we must turn our faces to crafty challenge 4. I am told that this challenge was my idea, but I don’t remember and I don’t want the credit. 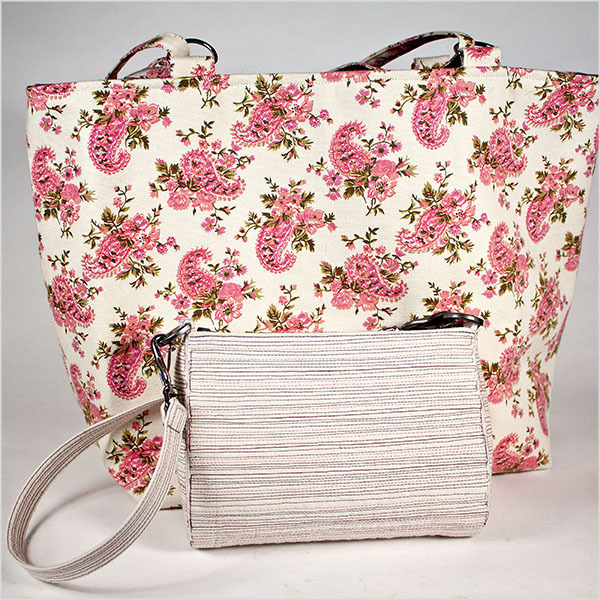 We are lovers of handbags and Kristin has this gorgeous Coach vintage purse. 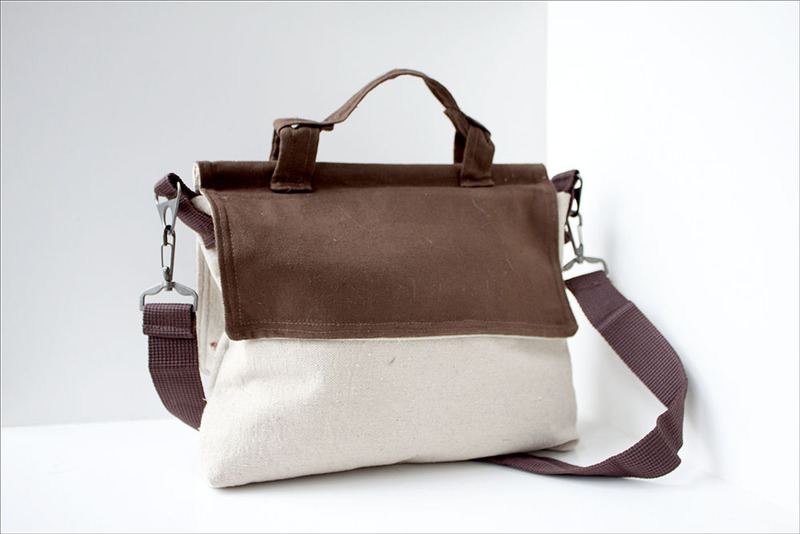 The challenge is to make a purse based on the spirit of this Willis Satchel. The project does not need to be a copy nor does it matter what materials we use; but the finished item must be in the spirit of the Willis design and done by Sunday, November 20. A handbag? Really? My idea? 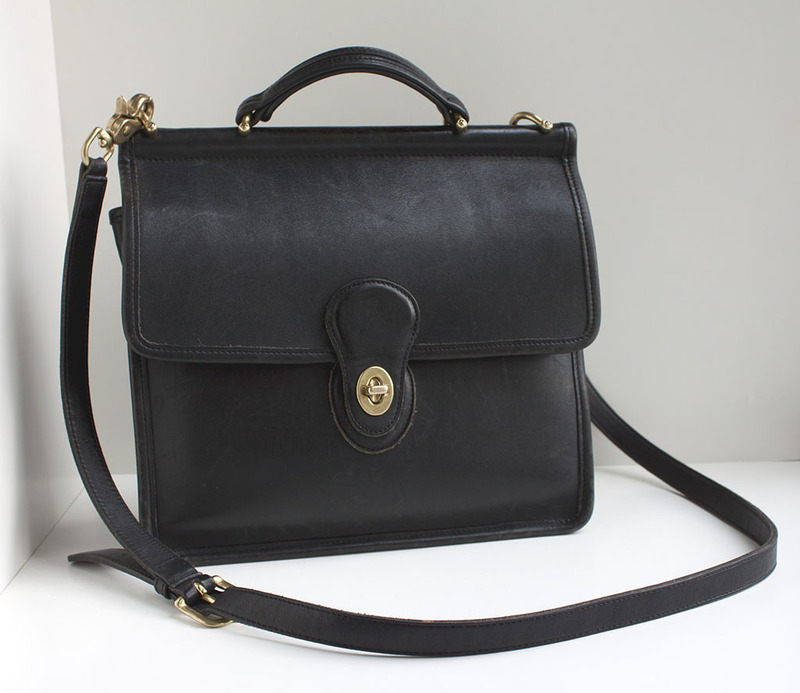 Side view of vintage Coach Willis Bag. -Lynne: Our hardware challenge sounded straight forward when we first proposed it. The idea of being turned loose in a hardware store seemed more like a dream than a challenge and the $5.00 limit on materials cost did not daunt me at all. We are “make-do” sisters. 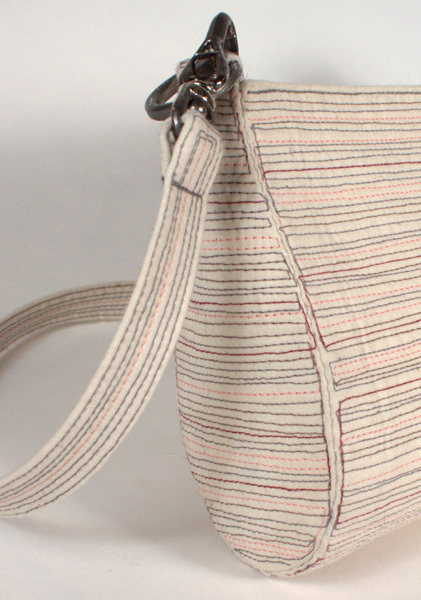 Earlier this spring, I found the book “Simply Sublime Bags” by Judi Kahn. In it she shows how to make “no sew” purses using fabric and duct tape. I was so taken by the idea that I made myself a keyhole clutch from a feedsack with matching duct tape. The pattern can be found here online, but the book is well worth getting for all the wonderful ideas. Beyond being extremely cute and novel, my clutch has been surprisingly durable. I have been wanting a slightly larger purse and this challenge seemed like the perfect time to make another one. After all, duct tape is to a hardware store like water is to a duck. Besides with a project like this, all I would need was the fabric and something to hold the fabric together in its purse shape. I’m afraid that I became rather testy when I realized that glue, thread, staples, paint, ink and tape would count towards the $5.00 total. I can tell you right now that no hardware store can sell you 50 cents worth of glue. We had to buy what materials we needed in the quantities available and we could not buy a quantity and divide the price by the number we used. I only wanted 4 yards of fishing line, but I would have had to buy 700 yards for $2.99. That was more than half my budget. I needed to rethink how to “sew” the purse together. I wandered the aisles of all the hardware stores in town. I had knowledgeable, helpful men following me trying to help me find the “right part.” They would always take a step backwards when I told them that not only did I not know the part I needed, I did not know what the part would be for. Hardware by its very nature is made to be used in the manner it was made. Wood screws are for wood and metal screws are for metal and never the twain shall meet. People who work at hardware stores are bewildered and confused by browsers. 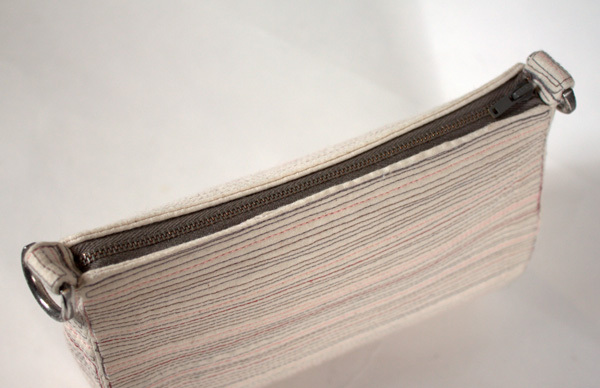 When I saw the fiberglass window screen, I knew I wanted to use it as the fabric for my purse. I could buy one foot of the 36″ wide screen and stay well within my budget. I noticed a roll of clear plastic vinyl next to the screen and remembered that plastic can be fused into a fabric by heating it with an iron. Heat unlike glue and staples would not cost me anything. I could sandwich the screen in between two pieces of the plastic and have both my fabric and my “glue.” I added some electrician’s tape which is cheap because it doesn’t stick to anything, a carriage bolt, a foot of copper wire and a brass hex nut to my list and I was 14 cents under my $5.00 limit. I found that fusing the “fabric” could be tricky. You have to keep in mind what will melt fastest and that plastic can shrink in odd ways and iron accordingly. The holes in the fiberglass screen allowed the plastic to adhere to itself, but I found that where I needed a strong bond I had to use just the clear plastic. By cutting the screen smaller than the plastic, the seams were only plastic and strong enough to hold all the stuff I put in a purse. I desperately needed some decoration for my purse and I only had 14 cents left in my budget, but I had become a crafty challenge participant. I gathered up the paper bag I had used for the free popcorn, the plastic bag for my purchases and the free telephone directory at the end of the counter and felt crafty as well as rich in materials. The electrician’s tape strengthened the open handles and made a nice decorative statement around the top of the purse. 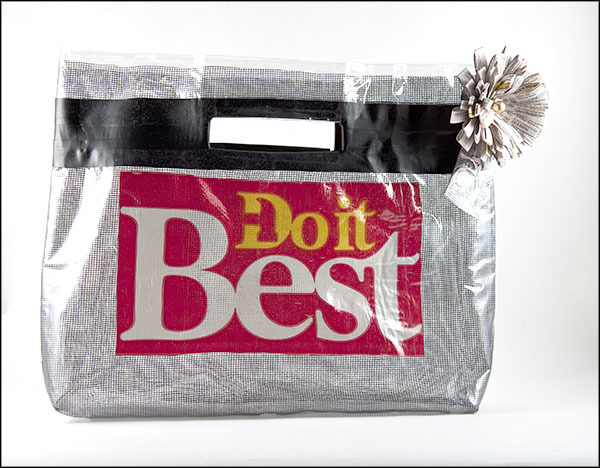 I fused the logo from the plastic bag to the front of the purse to add the graphic text and some much-needed color. Once you start fusing it is hard to stop. I fashioned the copper wire into my initial and fused it in a sandwich of clear plastic, fiberglass screen, the label from the paper bag and another layer of plastic for a hang tag. – Paper flower and hang tag initial. Hardware is hard and I wanted to soften it with a flower decoration. I had just noticed these paper flowers on craftgawker and I had that free telephone directory. I used a paper punch to put a hole in the edge of the purse and threaded the carriage bolt through it and the center of the folded flower. 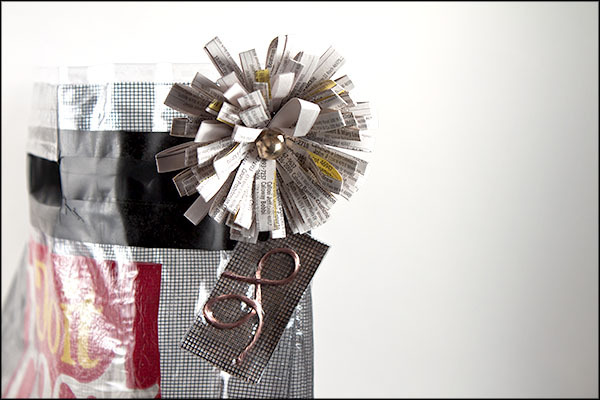 The hex nut secured the flower to the purse and made a “cuter than a button” flower center. I may fuse some more plastic around the handles now that the challenge is over and I don’t have to worry about a budget. But I am very happy with the results. I love the idea of making your own fabric and fusing is forgiving. If you make a mistake, keep ironing things on till you like it. That is the way to Do it Best. 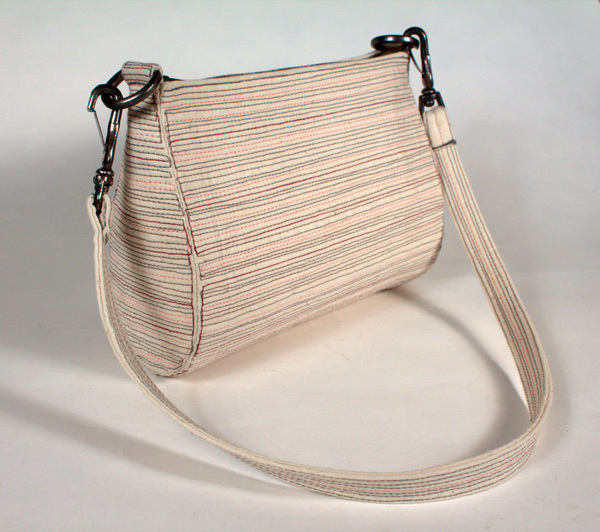 For this purse, I made and finished each piece separately, before assembling. Previously, I had made the pieces out of a quilt sandwich of muslin surrounding flannel. I didn’t have any flannel (and our fabric shop has left town), so I used six layers of muslin instead.I did not use a pattern for this. I made the main body the size I wanted, 7″ by 11″ long, and quilted it. Then I made the curve I wanted and sketched around it to create a pattern piece for the sides. 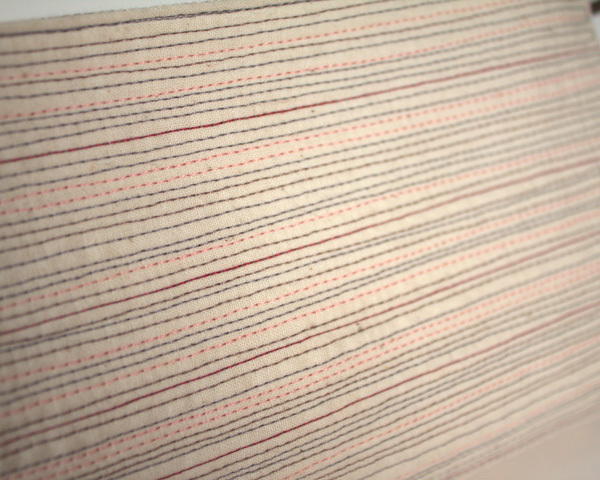 I had not tried multi-colored stripes before. I wanted this design to read as gray, so I used two shades of gray, with pink and fuschia. I did all of the quilting before assembly. The next step was to add the zipper (seen here on the finished piece). 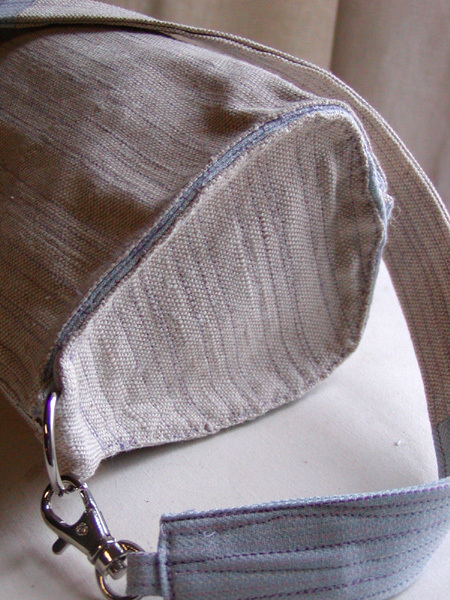 To sew a zipper into a tube, use a zipper that is a few inches longer that the piece. Baste the zipper into place, then sew it into place with the zipper fully open so you can get both sides under the presser foot. When you’re done, cut off the excess and sew a tailor’s tack over the teeth to keep the slide from coming off. The hardware was a pain for this project. Our local Joann’s Fabrics closed because a super Joann’s was opening in Kokomo, and evidently they can’t have two stores within 30 miles of each other. I stopped in at the new Joann’s when Kristin and I were in Kokomo to look for hardware, and the selection was simply terrible. They had no small d-rings. Kristin’s ingenuity came to the rescue, and she suggested that I use belt buckles with the center piece removed. They didn’t have the hooks I wanted, either (like the ones on the purple-stitched purse above). Instead, all they had were this spring type. Save yourself the headache and don’t buy the spring-type pictured here. They fall apart almost instantly. Also, the finishes didn’t match, as one was brushed and one was glossy. Spray paint to the rescue! 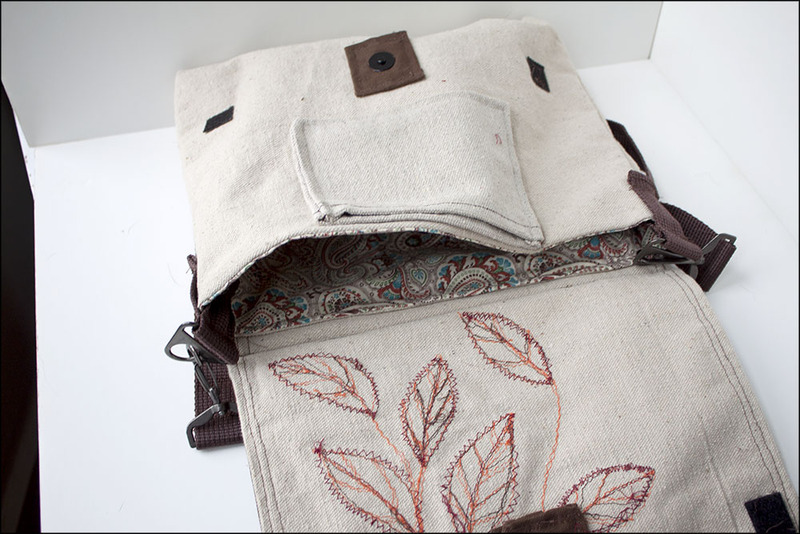 To assemble the bag, I slipstitched the sides together by hand. This looks really good, but honestly, it was a pain! And here is the finished bag! I will have to replace the hooks sooner rather than later, but I’m going to look at hardware stores to see if I can find better quality there. I’m looking forward to carrying them to work tomorrow!